Two weeks after the flood, floating debris remains trapped near the dam. There was a significant input of organic matter that has stagnated in the reservoir, as evidenced by the smell. 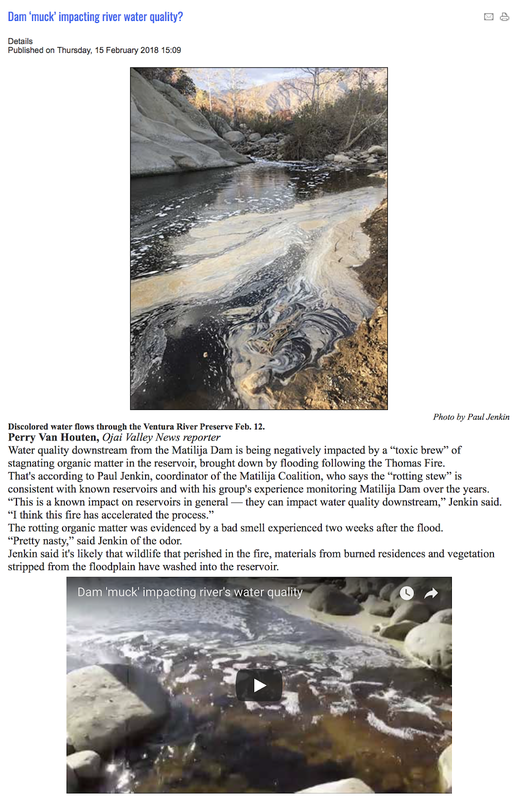 Flows entering the reservoir from upstream in Matilija creek as well as in the North Fork Matilija Creek are much cleaner. This is having a tremendous impact on downstream water quality all the way to the ocean. This is consistent with known reservoir impacts in general, and our experience monitoring Matilija Dam over the years. 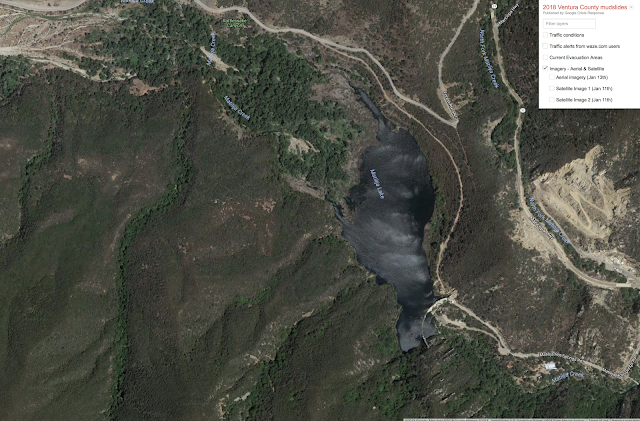 Under normal circumstances Matilija reservoir often retains suspended particles for weeks following a storm, greatly extending the negative effects of turbidity downstream. In the current situation, whatever has accumulated behind the dam has magnified this problem. 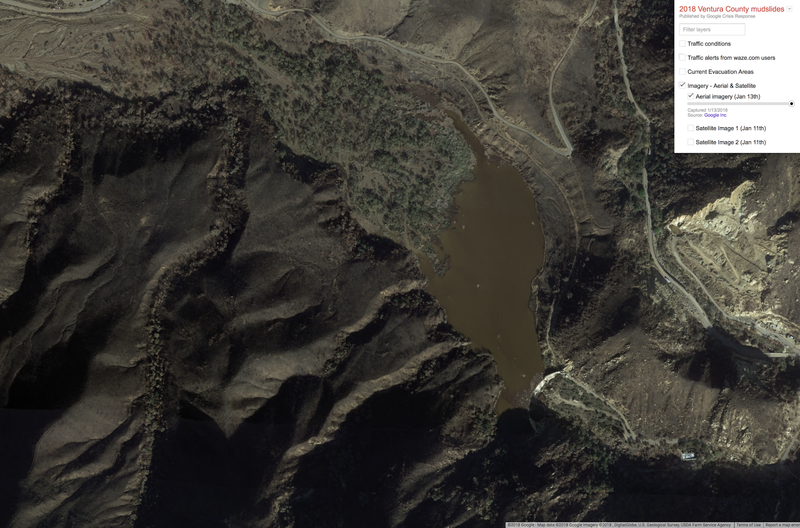 It is likely that any wildlife killed by the fire along with materials from destroyed residences has washed into the reservoir along with the vegetation that was stripped from the floodplain. Extremely high turbidity killed fish in the reservoir. The recent warm weather and stagnant water has created a toxic brew, which is slowly being released downstream. Although there have been concerns raised over the years regarding the negative effects of releasing reservoir sediment, this illustrates how removal of the dam will in fact enhance water quality once the initial flush is complete. On February 3, 2018, Santa Barbara Channelkeeper's Stream Team volunteers collected water samples throughout the watershed. In particular, the results demonstrated a significant impact from the dam, with bacteria and nutrient levels spiking below the dam and slowly decreasing downstream. Note that these levels were orders of magnitude above those that have been recorded since 2001! 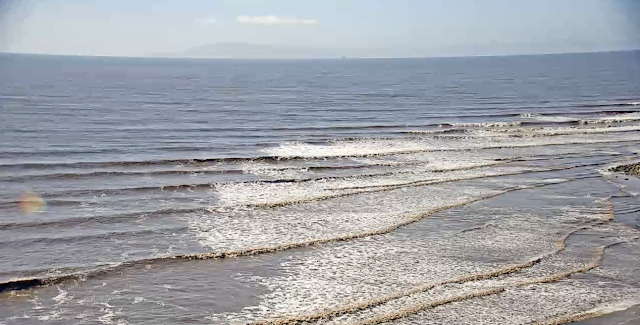 The Ventura County Chapter of the Surfrider Foundation has voiced concerns with water quality at the mouth of the Santa Clara River since our Blue Water Task Force identified high bacteria levels at this popular surfing location in the early 1990’s. Recognizing the benefits of integrated water management, the Surfrider Foundation has been a longtime proponent of recycled wastewater to enhance our coastal ecosystems. Wastewater discharges have historically impaired coastal water quality, and even with advances in technology, increased nutrient levels impact receiving waters. We would like to re-state our support for 100% recycling of the city’s wastewater to eliminate the discharge into the Santa Clara River Estuary. We do not concur with the analysis presented at the November stakeholder meeting that oversimplify the ecosystem associated with the Santa Clara River Estuary (SCRE.) Indeed, as other commenters have noted, this system is in fact much more representative of a coastal lagoon, since it does not maintain a perennial opening to the ocean. Indeed, it is this fact that creates the problems with the wastewater discharge. Without a regular exchange between the lagoon and the ocean, nutrient rich wastewater accumulates in an unnatural manner behind the beach berm. Only during large winter storm events or human intervention does this lagoon breach. This results in unnaturally high water levels and poor water quality. Any conclusion that determines that the lagoon is enhanced by the wastewater discharge are flawed. Although the resource agencies rightly are concerned for the endangered and special status species that rely on habitat at the mouth of the Santa Clara River, current conditions limit, rather than support those species. The unnaturally high water levels resulting from the discharge create a simplified pond habitat that is subject to episodic draining. Sea water exchange, a necessary part of this ecosystem, is also precluded with the flooded lagoon. The elimination of habitat complexity and poor water quality has created an ideal habitat for non-native species, most prominently carp. 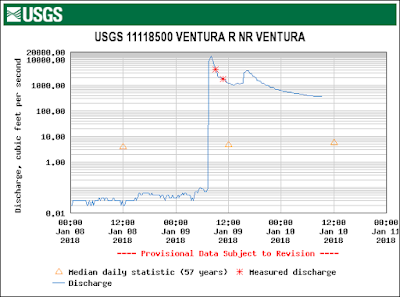 From our experience on the Ventura River, carp are the predominant fresh water species below the Ojai Sanitary District discharge on the lower Ventura River, relegating this reach to migratory status for the endangered Southern Steelhead. Steelhead may survive in such an environment, but they certainly wouldn’t choose it. 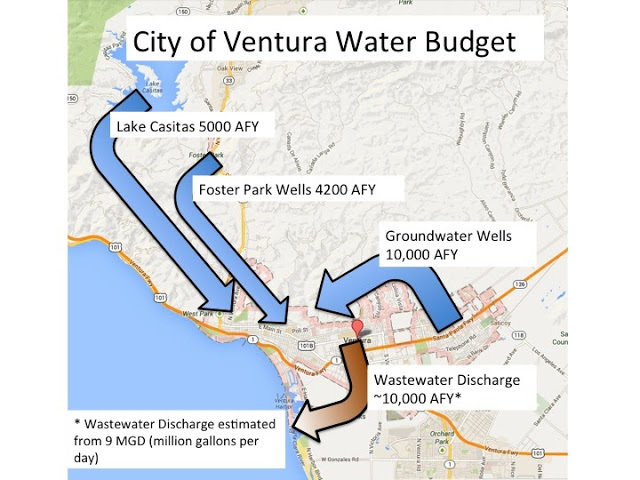 The City of Ventura relies on a wellfield at Foster Park and surface storage from Lake Casitas for more than half the water supply. Both of these sources are currently stressed from over allocation during the prolonged drought. 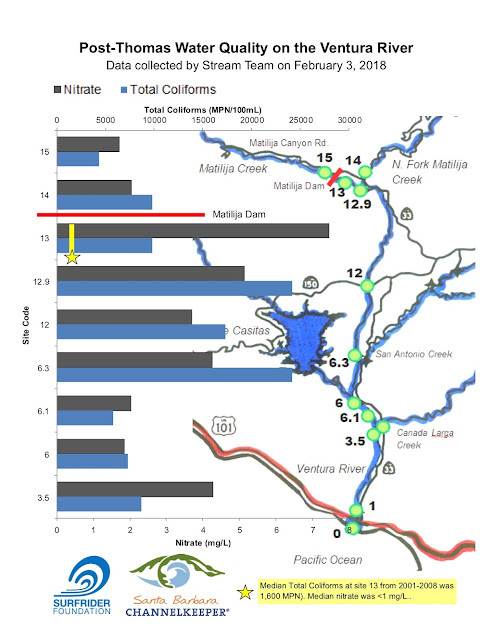 How could a point source discharge directly into the Santa Clara River Estuary be considered to mimic “natural” processes and enhance the habitat, when much of the water originates from the adjacent watershed? Most significantly, studies have documented the high quality spawning, rearing, and refugia habitat in the Ventura River upstream of the Foster Park wellfield. However, flows in this reach have become seriously impaired by over-extraction of groundwater, to the point that in recent years this refugia habitat has dried up for extended periods during the critical summer and fall months. It should be noted that this reach of the Ventura River was historically known as the “live reach,” for the rising groundwater in the vicinity of Casitas Springs, which was also named for this phenomenon. These are precisely the conditions that favor native species such as the southern steelhead. Indeed, recent population surveys have documented the presence of native trout in this reach. Consider the potential benefits from developing a “new” supply from recycled water. These slightly outdated supply and demand numbers are taken from the City's 2013 Final Comprehensive Water Resources Report. It is evident from this graph that if 'new' sources of water are not found the city will outgrow its water supply in the near future. 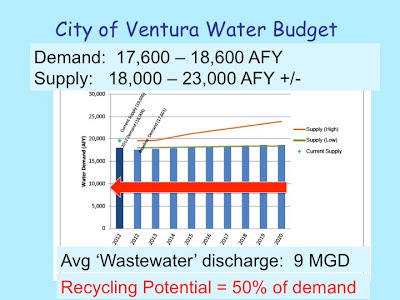 The red arrow shows that the potential for recycled water in Ventura is close to 50% of demand. (Of course the actual volume would be less than this depending on treatment and reuse options, but this demonstrates the overall magnitude.) Therefore water recycling would provide an opportunity to eliminate the flooding problem at McGrath as well as offset municipal water demand (i.e. an 'integrated solution'.) This demand offset could provide an opportunity to reduce pumping at the Foster Park wellfield during dry months of the year to sustain the critical habitat within the “live reach” of the Ventura River. We encourage the City of Ventura and the stakeholder resource agencies to carefully reconsider the potential benefit from maximizing the recycled water potential. 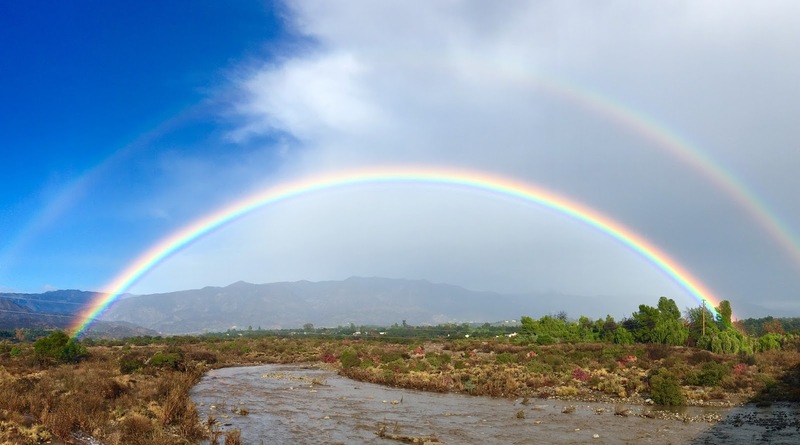 Rather than choosing to maintain an artificial pool at the Santa Clara River Estuary, which has very limited habitat benefits, demand offsets gained through recycling 100% of the wastewater effluent may be applied to the enhancement of the comparatively high quality habitat in the Ventura River. In turn, the coastal lagoon will return to a more natural hydrology with improved water quality and habitat, while also eliminating the non-native habitat conditions that are currently degrading the SCRE ecosystem. On January 9, 2018, the watershed received a significant storm following the Thomas Fire. 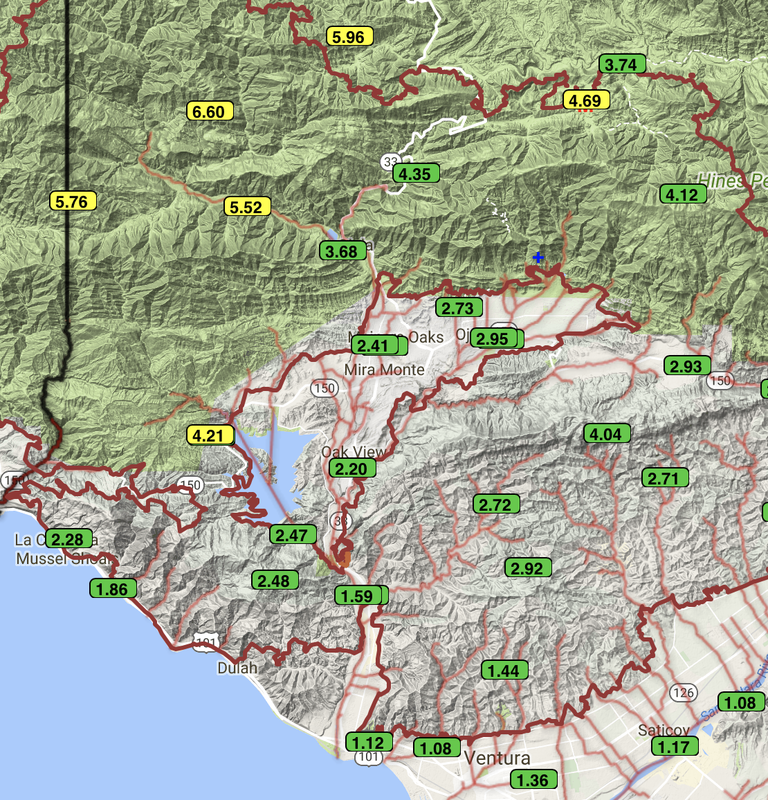 The bulk of the rain fell overnight and early in the morning of January 9. Fortunately the highest intensity rainfall missed our area and did not result in the widespread destruction seen up the coast in Montecito. Forecasters had predicted up to 9" in the mountains, whereas we actually received 5-6" with only 1-2" in the lower elevations. 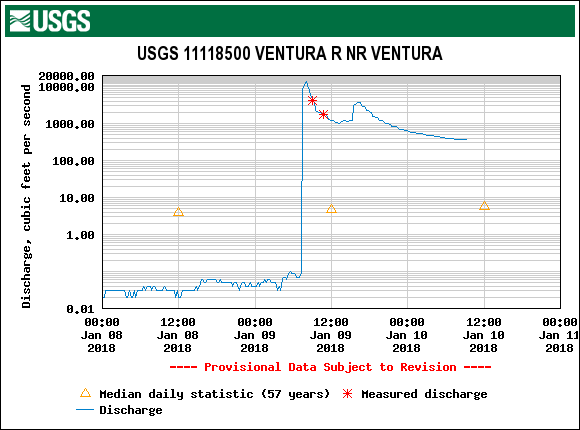 While many of the county gages appeared to have been damaged, USGS was out surveying at Foster park during the storm (red stars on hydrograph.) 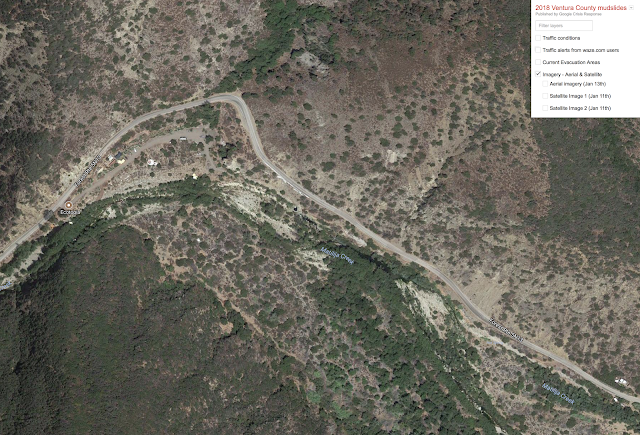 Peak flows at Foster Park were over 10,000 cfs, with perhaps 6,000 cfs originating from Matilija Canyon. The hydrograph shows the effect of heavy rainfall around midday which bumped the flow back up. 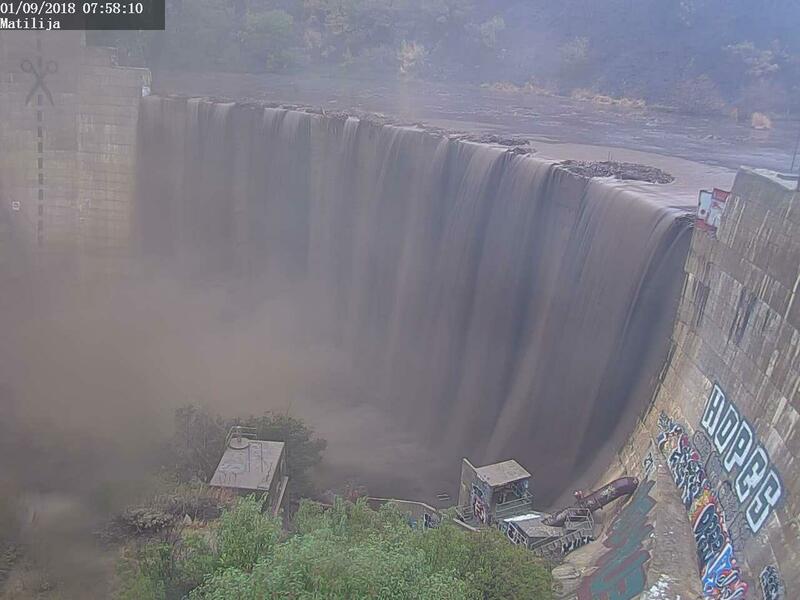 The water during initial runoff was very black, as expected with all the ash from the fire. The river remained very dirty into the evening hours. The storm cleared rapidly in the afternoon, producing striking rainbows throughout the valley. Suspended sediment from the erosion of the burn area persisted in the river for the next few days. 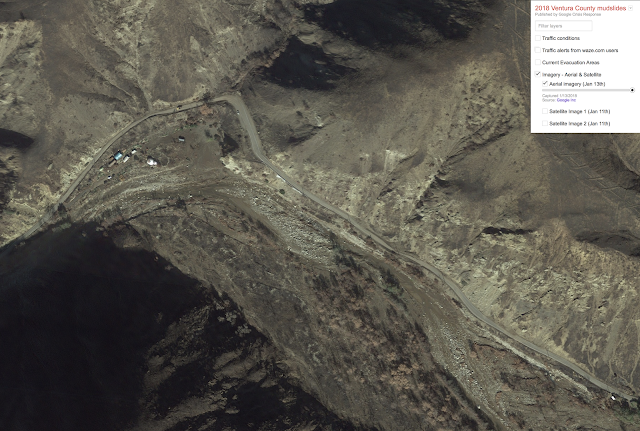 Fine sediment deposits along the riverbank can be seen in the photos below.